Our collection of whitepapers, articles, case studies, tipsheets, and infographics has been cultivated to help healthcare organizations understand the power of their healthcare data. With an average volume of over 200 patients a day, a busy Pacific Northwest area Radiology practice could not keep up with manual processes related to checking benefits and providing cost estimates to patients. Utilizing the MD Clarity software has proven beneficial to both patients and staff. Patients love having a clear picture of their financial responsibility. Staff enjoy the increased automation, reducing their manual tasks by 85%. The practice has seen a dramatic reduction in bad debt and an increase in patient collections. A growing physician practice with 30 locations and 2 surgery centers was looking for a single solution to help manage their insurance contracts and patient benefits to ensure optimal collections from patients and payers. They wanted to establish a scalable process to share accurate costs with patients before surgeries, while also ensuring they were getting paid correctly by insurers. Using MD Clarity, the front-end staff enjoy the increased automation of benefit eligibility checks and the back-end staff has been able to properly analyze contracts saving them several million dollars in underpayments. Healthcare organizations often leave money on the table due to the financial landscape of the healthcare industry. Inefficiencies in the revenue cycle, bad debt, and traditional payment models compound this issue and need to be addressed in order to increase cashflow. 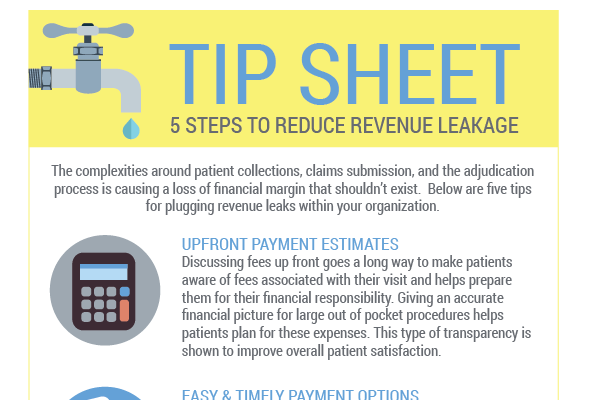 We discuss five actionable tips to help plug revenue leaks within your organization. With an increasing focus on price transparency in the healthcare industry, it is important that practices provide the same level of discipline around pricing as other industries. When consumers can’t easily access basic information on cost and quality they don’t know how to select the most efficient and effective service, leading to increased costs for all parties. Delivering greater price transparency to patients upfront has become an essential tool in getting practices paid on time with greater accuracy. How to maintain the highest level of revenue integrity and reduce revenue leakage in your organization. Providers need a better way to face the demands for greater price transparency and account for shifting payer contract methodologies, complex patient benefits, and downward pressure on reimbursement. EHR and Practice Management Software products were designed primarily to capture the necessary elements to code and send claims to insurance companies and keep documented clinical records of patient visits. Providers are facing new challenges around price transparency, evolving payer contract methodologies, and shrinking margins that these systems are ill-equipped to address.